Former Real Madrid boss Zinedine Zidane is understood to be ‘on standby’ to take charge at Manchester United according to a report published by The Mirror. According to the report published on Saturday night Zidane has told friends that he expects a call from the 13-time Premier League champions if the situation with United boss Jose Mourinho gets any worse. 46-year-old Zidane could be a revelation at United. The Frenchman made history by delivering three consecutive Champions League wins with Real Madrid before he decided to leave Los Blancos this summer. The report suggests that Zidane has a burning desire to manage in the Premier League. 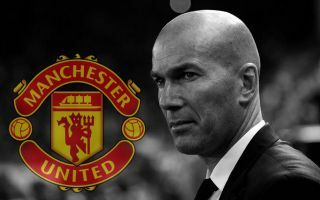 And United could make a move sooner than people think as Zidane – a free agent could be tempted by interest to take charge at some of Europe’s other biggest clubs. Zidane could steer United to League and European glory. United are three time winners of the Champions League and having Zidane at the helm of the club could help close the gap with rivals Liverpool who hold five European Cups. Zidane could prove to be a major coup for United should he decide to join them as the French legend could encourage wantaway midfielder Paul Pogba to stay at United under his tutelage. ESPN reported that United have put contract talks with the World Cup winning midfielder on hold for the time being due to the 25-year-old being unsettled by the club amid interest from Barcelona.